• BEC output voltage(6~8.4V) to show great performance on the torque & speed of servo. • BEC output utilizing switching power system,suitable for 2S~6S Li battery,with continuous current rating of 5A,and burst rating of 7A. • Three programmable throttle speed settings to support quick throttle response. • Govener Mode(governor speed controller•slow down system). • Small and compact PCB design for ease of installation. • Large heatsink for great thermal performance. 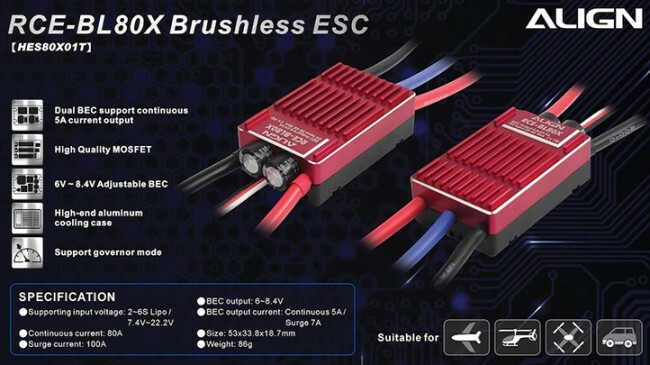 • High compatibility to work with 98% brushless motors in the market. • Ultra smooth motor start design to run with all kinds of brushless motors. • The power inlet adapts Japanese made "Low ESR" capacitor in order to provide stable power source. • Users can use the transmitter to operate the motor setting by Super stylized CPU. • If the aircraft should land or crash in an unexpected location and become lost, the pilot can enable the Aircraft Locator Option. The Aircraft Locator Option is engaged by tuming off the transmitter. When the ESC does not receive a signal from the transmitter for 30 seconds, it will start to send an alarm to the motor. The sound of the alarm will aid the pilot to locate the aircraft. This option will not work with a PCM receiver that has SAVE function enabled, or with low noise resistant PM receivers. • Use for T-REX 500X/500L/500PRO DFC.